Michael Giglio came up with the idea for EVITA while waiting for the school bus. “Our local fire station is next to the bus stop – while waiting I have seen many examples of traffic driving past the fire engine while it is trying to get from the fire station onto the road,” he said. Michael Giglio came up with the idea for EVITA while waiting for the school bus. “Our local fire station is next to the bus stop – while waiting I have seen many examples of traffic driving past the fire engine while it is trying to get from the fire station onto the road,” he said. Loud car stereos, high-tech earbuds and enticing phone screens mean drivers and pedestrians are more distracted that ever – so we often miss the bright lights and screaming sirens of emergency service vehicles. 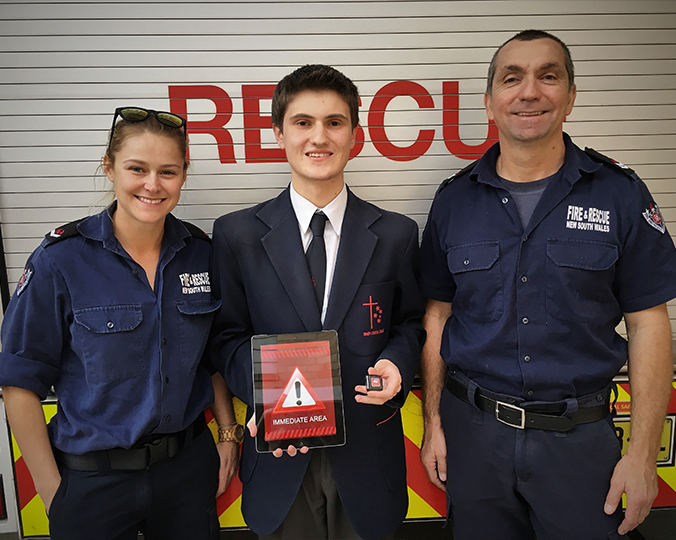 Michael’s invention works by connecting an app on the user’s phone with a Bluetooth-powered iBeacon installed inside emergency vehicles. Turning on the vehicle’s lights and sirens activates the iBeacon, and nearby app users receive audio alerts that an emergency vehicle is in their far, near or immediate area.